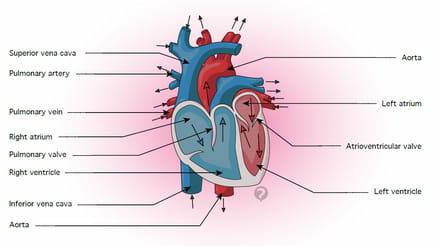 The pulmonary artery begins at the right ventricle of the heart, then separates into two to connect to each lung, where it divides into numerous branches. The role of the pulmonary artery is to transport deoxygenated blood from the heart to the lungs. A pulmonary embolism occurs when the pulmonary artery is obstructed by a clot which interrupts blood circulation. Divers sometimes fall victim to pulmonary embolisms due to the presence of a gas bubble in the pulmonary artery. Original article published by Jean-François Pillou. Translated by Jean-François Pillou. Latest update on August 19, 2014 at 12:31 PM by christelle.b. This document, titled "Pulmonary artery - Definition," is available under the Creative Commons license. Any copy, reuse, or modification of the content should be sufficiently credited to CCM Health (health.ccm.net).